Common vein condition is mostly cosmetic. Spider veins are similar to varicose veins, only smaller. Essentially, a spider vein occurs when a vein becomes weakened and there is a back-up of blood that causes the vein to break off and form a dead end. They rarely cause non-cosmetic symptoms. These veins are located close to the surface of the skin and look like spider webs, hence the name. They can appear purple, red or blue and are generally located on the legs and face. The causes of spider veins are varied. Heredity and gender (mostly women) are both factors, as well as standing on your feet for long periods of time. Other physical conditions that can compromise blood flow, such as obesity, can cause spider veins. There also is a hormonal component to spider veins, and they sometimes appear in women after pregnancy, during menopause or puberty. Typically, spider veins are not painful, but if you would like to rid your body of these unsightly red and blue surface veins, there are several treatment options. The most common treatment choice for spider veins is called sclerotherapy. This treatment consists of several microinjections of an FDA-approved solution into the spider veins, effectively sealing them off and preventing blood from flowing into the malformed vein. The blood naturally reroutes to healthy veins and over time, the spider veins begin to disappear and are eventually reabsorbed into the body. Side effects of sclerotherapy are generally mild and consist of mild pain, swelling and redness at the injection site. The risk of complication during sclerotherapy is very low. Studies have shown that another option, laser vein therapy, is more expensive and less effective than sclerotherapy. 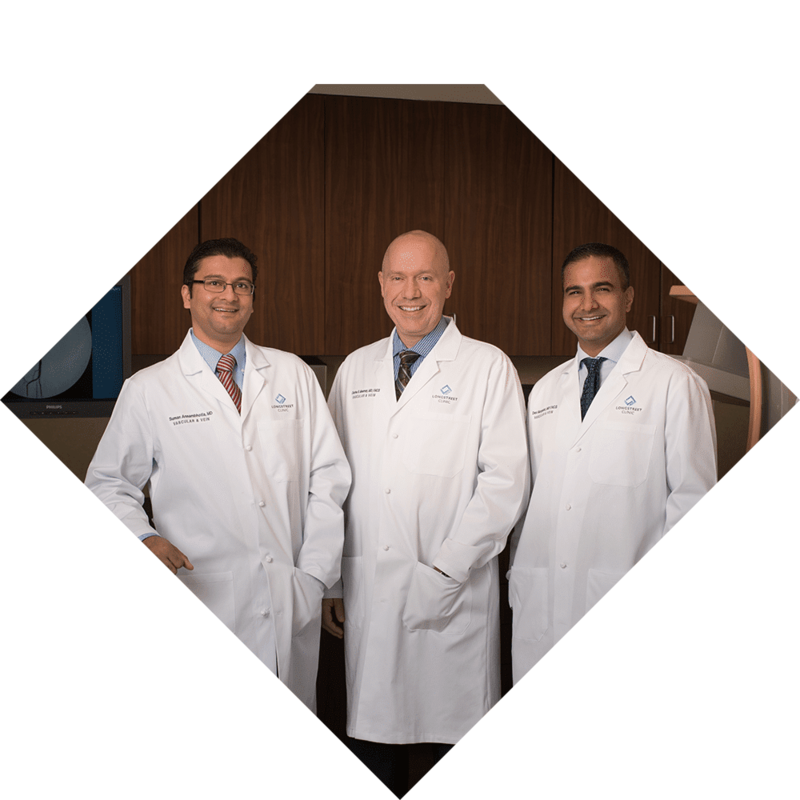 The board-certified vascular specialists at Longstreet Clinic have amassed more than 30 years of combined experience. With comprehensive diagnostic testing and an onsite vascular lab, the physicians and staff are able to better understand the causes of your vein issues to ensure proper treatment and prevention. For more information or to schedule an appointment with any of our physicians, contact us or please contact 678-207-4000.